With the unflattering nickname of “Clever Piggy”, Allen Cunningham is one of the quietest, most unassuming poker professionals you will ever see. Unlike many, he lets his play do the talking. At the table, Allen is so cunning (no pun intended), calculating, and unflinching, it’s scary. And yet, if you did not know who he was, you would never think he was a threat at all. Allen attended UCLA, fully intending to earn an engineering degree. But when you find that you can make a lot of bank playing poker at the local casinos, engineering starts to sound a little less appealing. So, he went pro. Since then, Allen has compiled a record that ranks among the best of his generation. He made four final tables at the 2005 World Series of Poker, winning once; he then made three final tables at the 2006 WSOP, winning once and placing fourth in the Main Event; and this year he has already won nearly half a million dollars at the 2007 WSOP. Those, plus previous two bracelets and countless cashes, contribute to his third place ranking on the all-time WSOP money list. Out of the top five on that list, he is one of two who have not won the Main Event. Even with all his hardware, Allen is most proud of being named by his peers as the best all-around player under the age of thirty-five. Allen also won the WSOP Player of the Year award in 2005. To date, he won 5 WSOP bracelets, 18 Final tables and finished in the money 55 times. His total live tournament winnings exceed $11 million. 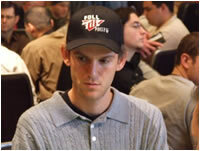 Was a member of Team Full Tilt as one of their Poker Pros.